Pictured as: the John Cudahy (Allman-Hubble) Photo courtesy of: P.S.M.H.S. Built in 1900, by H.B. Kirby at Ballard, Washington as the John Cudahy for the Pacific American Fisheries Company of Bellingham, Washington. In 1903, she was acquired by the Grays Harbor Stevedoring Company of Aberdeen, Washington. Where the tug retained her name. 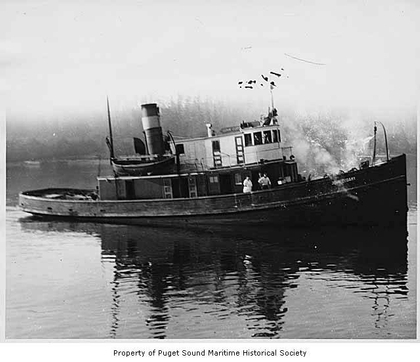 The tug was later acquired by the Merrill and Ring Lumber Company of Pysht, Washington. Where she retained her name. In 1920, she was acquired by the Pacific Tugboat Company of Aberdeen, Washington. Where the tug retained her name. The tug was later acquired by the Allman-Hubble Tugboat Company of Aberdeen, Washington. Where she retained her name. In 1934, she was acquired by the Knappton Towboat Company of Astoria, Oregon. Where the tug retained her name. In 1941, the tug was acquired by the Foss Launch and Tug Company of Tacoma, Washington. Where she was renamed as the Henry Foss. On February 13th, 1959 she sank in 150(ft) of water near Saltspring Island, British Columbia. The Foss Launch and Tug Company replaced her steam engine, with a single, diesel engine. The tug was single screw, rated 750 horsepower.